NAIROBI, Oct 24 2008 (IPS) - The Kenyan government has hailed bio-diesel as an innovation that combines green politics with poverty reduction. But recent drops in biofuel prices have caused concern about the sustainability of alternative fuel production. Rural farmers who have invested all their savings into growing oil seeds now fear they have opted for the wrong venture. Over the last few years, the Kenyan government, NGOs and industry have pushed the production of bio-diesel – which is environmentally sustainable because it emits fewer toxic air pollutants and greenhouse gasses than petroleum-based fuels – and many small-scale farmers have placed their hopes into oil seeds as a new avenue to earn money. Initially, biofuel projects seemed to be a success, with farmers more than doubling their usual income. In Ngurumani, a small town in Kenya’s Rift Valley, for example, farmers started to sell the seeds of the jatropha tree for bio-diesel production, which had an immediate, positive impact on reducing poverty and hunger in the region. Farmers who previously used to plant food crops for household consumption only, started selling seeds for as much as $10 per kilo. Esther Siteyia, a 28-year-old Maasai from Ngurumani, told IPS she bought and sold over five tonnes of the seeds during the last twelve months. "For the first ten months that I sold Jatropha seeds, my income tripled. I would buy seeds from farmers and sell them to the highest bidder at a handsome profit," she says. Small-scale farmers who sold the seeds to her also made good profits, increasing their income to more than $1 a day. Originally from Central America, the drought-resistant jatropha tree has been growing in Ngurumani for decades. 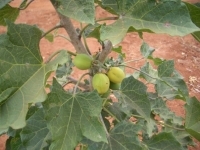 Yet, until recently, the Maasai, who traditionally use jatropha trees for fencing of homesteads, marking graves or treating cuts, were unaware that the black seeds of the trees were in fact valuable sources of biofuel. In another town in Central Kenya, Naromoru, a collaboration between NGO Help Self Help, the Jomo Kenyatta University of Agriculture and Technology in Nairobi and Dutch bio-diesel manufacturer Solarix launched Kenya Eco-Energy, a project that encourages rural farmers to use two other types of seeds, castor and croton, for environmentally friendly bio-diesel production. Small-scale farmers earned $0.15 per kilogramme of castor or croton seeds. "Every day, I now make about 200 shillings ($2.5) from the seeds,’ says Ann Njeri, a housewife and mother of three who lives on a small farm outside Naromoru. However, the farmers’ luck ran out in April when biofuel prices suddenly plummeted from an average of $10 per kilo to less than $0.5 per kilo. Biofuel research companies, producers and NGOs supporting the production of environmentally friendly diesel had created an artificially high demand for the seeds, which resulted a high pricing structure that could not be maintained in an open market in the long-term. In addition, the development of regulatory policy frameworks and local infrastructure needed to manufacture bio-diesel took longer than expected. As a result, Kenya has only few biofuel processing plants that struggle to keep up production with seed supply, and many rural farmers cannot afford the costs of transporting their seeds to the nearest factory. Siteyia’s storeroom in Ngurumani, for example, is now filled to the brim with Jatropha, but she has no buyers for her seeds. The Kenya Eco-Energy project, to which she initially sold the seeds, has run out of capacity, and the nearest oil seed processing plant in Central Kenya is more than 200 kilometres from her village, too far for her to transport the seeds herself. Although the production of biofuels creates environmental sustainability, farmers will not be able to continue investing in them if they don’t have a market to sell their produce. Numerous Kenyan farmers who have put their little savings into the planting of oil seed producing trees have now lost their initial investments. Yet, energy experts remain optimistic, predicting the demand for biofuels to increase in the near future. According to the International Energy Outlook of 2007, global oil consumption is projected to increase by about 36 percent by 2030. In Africa, oil consumption is projected to double in that time. Already, global bio-diesel production is on the increase, growing from one billion litres in 2000 to six billion litres in 2006. If this trend continues, oil seed farmers may reap substantial profits within the next few years. Farmers now set their hopes on the Kenyan energy ministry that promised to support bio-diesel production as a poverty reduction strategy. It recently passed policies to encourage the building of bio-diesel refineries in rural areas and said it expects the country’s bio-diesel industry to increase household income levels by 30 percent by 2012. John Kioli, director of Nairobi-based NGO Green Africa Foundation, agrees that more money needs to be invested into small-scale biofuel production to turn around the downward trend in pricing. "For profitable and sustainable markets to be realised, local communities need their own processing plants that absorb locally available seeds. The guiding principle should be to use local raw material for local production and for local consumption," he explained. Biodiesel is not only supported by governments for poverty alleviation and environmental reasons, it is also cheaper than regular diesel. At a filling station in Naromoru, a long line of motorists cue to fill their vehicles with bio-diesel. At $1.1 per litre, bio-diesel is ten cents cheaper than ordinary petrol, a price difference that accumulates to substantial savings for drivers. "Every day, I cover 300 kilometres with my public minibus. I am now saving about $90 every month because of using bio-diesel," minibus driver Maina Kamau told IPS.